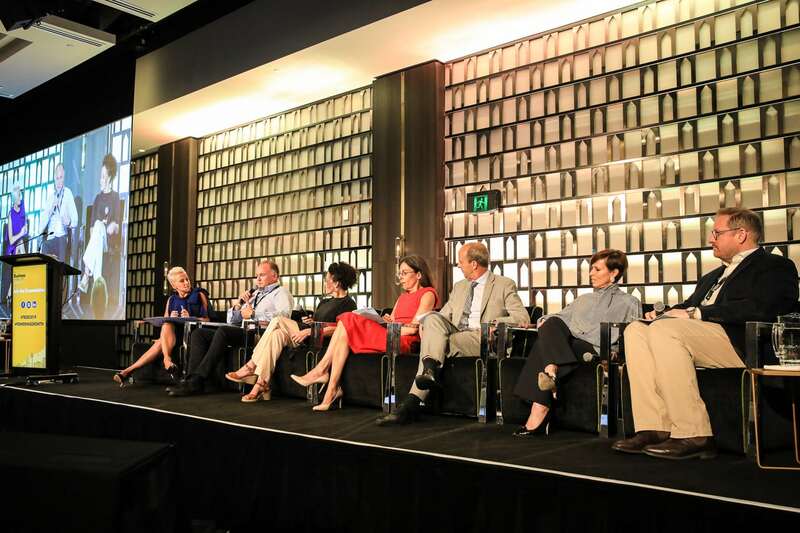 The Business of Events conference, themed ‘Powering Growth’, took place at the Sheraton Grand Hyde Park, Sydney. The inaugural event was a great success, living up to its promise of being unlike any other conference in the industry. The conference covered key topics including international events; creating engagement; data security and business risk sales and marketing. Attendees walked away with invaluable insights and knowledge on the future of the events industry. Following Laura’s opening address was the first panel session, ‘The Business of Making an Australian Event an International Success’, where she was joined by six industry stalwarts and experts to explore the changing role of the events industry and how this impacts the future of events. The panel also delved into the importance of building communities and looking to the future, setting the scene for the rest of the conference. ‘Industry Growth and the Big Picture’ presented by Craig James, Chief Economist, CommSec, gave attendees an overview of the global and domestic economic outlook, questioning how this will impact the events industry. Last year the global economy grew 3.7% and this year the forecast is 3%. This will impact company’s expenditure and may impact the sponsorship money, or companies wanting to hold events. Attendees were empowered and encouraged to voice their opinions with presenters, opening up the floor to conversations that are typically hard to have in the events industry but that need to happen. Gary Daly, Managing Director of organiser Exhibitions & Trade Fairs, said the hard conversations need to happen. “The events industry has changed, it’s all about growth and adapting, what we have been able to do is acknowledge and actually provide some key insights into the global events landscape. The Business of Events presenters lead fantastic discussions around the challenges and issues faced in the international marketplace. We’ve had great feedback and the conference was a success,” said Mr Daly. The Business of Events exceeded expectations and delivered the next must attend conference in the events industry, read what Laura Schwartz had to say. For more information visit: www.thebusinessofevents.com.au. Pictured from left to right; Laura Schwartz, Former White House Director of Events; Andrew Stark, General Manager, World Surf League; Terese Casu, CEO, Sydney Gay and Lesbian Mardi Gras; Helen Sawczak, National CEO, Australia China Business Council; Andrew Westacott, CEO, Australian Grand Prix Corporation; Penny Lion, Executive General Manager of Events, Tourism Australia; and Damien Hodgkinson, Executive Director, Melbourne International Comedy Festival.